Our cover-to-cover tour of the Aardvark Ltd. catalog from February/March 1983 continues, with a look at the company's substantial lineup of adventure games. The text adventure genre flourished in the early days of home computing -- a single author could put an acceptable game together fairly quickly, and literally thousands of such games were commercially published around the world. While many companies mimicked Scott Adams' pioneering approach, creating a custom driver for each computer platform with identical, portable data content, Aardvark actually converted the BASIC code to run on the TRS-80 Color, Timex/Sinclair, VIC-20, Commodore 64, and TI99/4A home computers. This labor-intensive approach didn't keep the company from publishing quite a few of these titles, but most of these are very hard to find today. Aardvark was a small company, and I am amused at the way founder Rodger Olsen can't help commenting at length on the games he is publishing and creating -- while his personal opinions are interesting to read, I can't imagine they carried a lot of weight with potential buyers. "I like that" and "[I] came up with some ingenious problems" are charming if unsubstantiated claims, but getting calls "from bleary eyed people who are stuck in the Pyramid and desperate for more clues" doesn't necessarily imply that Pyramid will be a lot of fun to play. 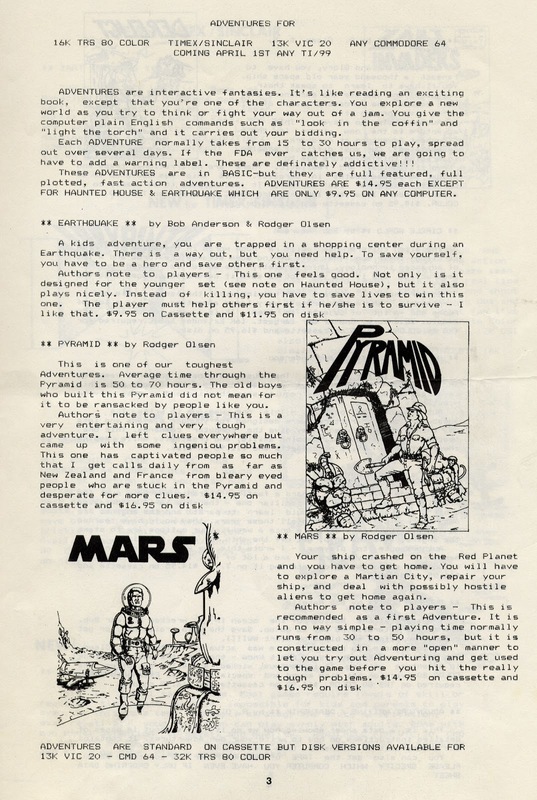 Pyramid and Mars would later be re-released in 32K editions with added graphics, as the industry evolved and illustrations became more common on platforms like the TRS-80 Color Computer. Page 3 continues the lineup -- later on, Aardvark imported some additional titles from the U.K. and put out an adventures-only catalog under an alternate company name, so the genre must have been profitable for Mr. Olsen. I have actually played Derelict, in its Commodore 64 edition, but the remaining games on this list are completely unfamiliar to me. Circle World is apparently inspired by Larry Niven's Ringworld science fiction novels; Haunted House is a kids' adventure; Trek is clearly and unofficially based on Star Trek, another common occurrence in the wild-and-woolly early days of computer gaming. Nuclear Sub, we are told, was plotted by Rodger Olsen, Bob Retelle, and "someone you don't know" -- and we are given no introduction to this mysterious person. 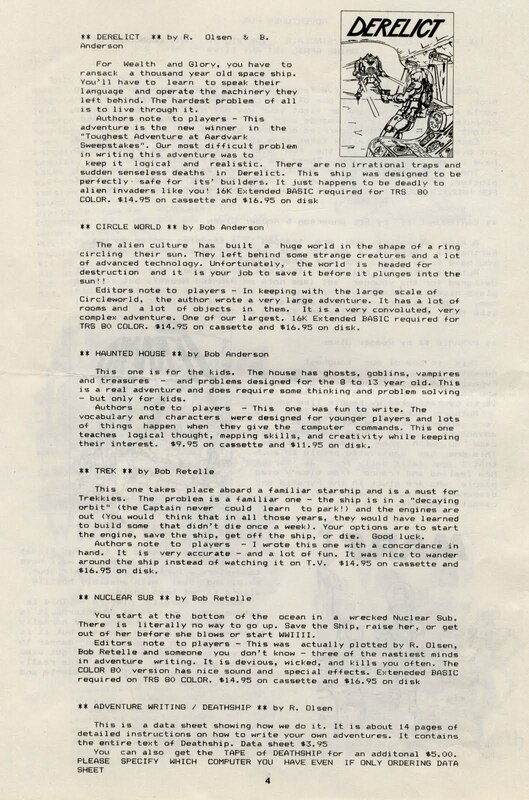 And Adventure Writing / Deathship is a tutorial, just instructions and a source code printout for $3.95, although a cassette can be purchased for additional $5.00 to save typing in the source code. In my early, informal programming education, I learned quite a bit from typing in the code myself, so I wonder if many people anted up for the tape. Next time, we'll start looking over Aardvark's lineup of action and arcade games. Cool find! I remember having a few Xeroxed and hand-stapled game catalogs back in the 80s too. Have you done any reviews of these Aardvark games? "Nuclear Sub" and "Trek" look especially intriguing. Lol.. I remember Nuclear Sub Adventure and Trek Adventure. The problem of course in those days was that it was very expensive for any one programmer to own all the different systems, and you had to have the native system in order to test the software. In the earliest days Aardvark wanted the OSI games all written so they'd run on either the OSI C1P or the C2P from the same cassette tape. Problem with that was I only had the C1P and had to pretty much guess at how it would look on the C2P's different display. That process was so frustrating I stopped doing that pretty quickly. Not to mention there were very few C2Ps in the world and there was little demand for games for them. 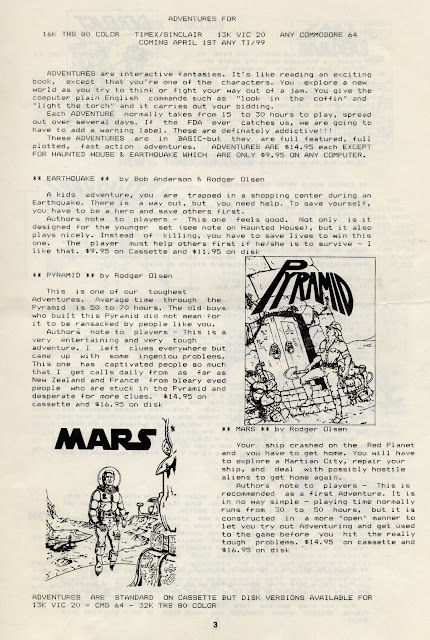 The TRS-80 version of "Nuclear Sub Adventure" was written on the TRS-80 computer at Aardvark (which of course meant it belonged to them), and I "financed" the purchase of a TRS-80 Color Computer through Aardvark so I could write those versions on my own machine. Eventually I bought both a Commodore-VIC20 and C-64, but by then I'd pretty much stopped submitting anything to Aardvark. When the Atari Home Computer series came out I became fascinated with their more advanced technology, but Rodger Olsen refused to enter that marketplace (for reasons he never really explained), so I spun off and started my own software company. Nope, we welcome lengthy comments, Bob! Thank you very much for stopping by and sharing your recollections of the Aardvark days and the early industry. I'm always interested in hearing this kind of thing -- we can glean some of the history from the published promo material and reviews, but the "real" behind-the-scenes tales are too often being lost to the ages. Very much appreciated. Ha.. the last one didn't crash the comment software..! I remember discovering some of the bugs of other games in early testing (it was pretty common for Rodger to hand out tapes of new games before they were put in the catalog), but it was like pulling teeth to get him to fix any of them. In "Mars Adventure" (or was it "Pyramid".. hmm.. I forget exactly), there was a stairway with exits that didn't line up with the next locations. That is, you'd exit to the East, say, and end up in a room with exits to the North and South. Going south would take you back to the first room (it should have said West). Made it really tough on people who liked to map the advanture. Rodger's response was something like "tough". Another one let you eat the key that was absolutely essential for escaping (maybe that was the Pyramid bug). Again the answer was "well, then don't eat the key". I did the original version of "Nuclear Sub Adventure" on the CoCo and was able to make use of its color and sound abilities to add a few rudimentary graphics effects (like the room filling with water, and engine sounds). I don't believe I ever saw the C-64 conversion though, so I don't know what they did for that. "Trek Adventure" had a tricky little puzzle involving finding the right type of screwdriver to fix the ship, and unless the player was very observant they could spend a long time wandering around looking for it. Aardvark got so tired of answering one customer's questions about the game that they finally gave the guy my phone number and made me deal with him. When I finally gave him the answer he sounded pretty distraught.. I hope he didn't do anything rash. The Aardvark Adventures series were pretty simplistic, mainly because the computers we were using in those days were so limited. We used the built-in BASIC interpreter because it allowed much faster development of the games (as opposed to hand-coded machine code- there really weren't any development tools in the beginning), but the OSI C1P only came with 4096 Bytes of RAM (8192 in the "expanded" version), and after the computer allocated some RAM for itself, it left us with very little room to program in. The C1P had a particularly nasty problem called the "Garbage Collector Bug", where a bug in the BASIC interpreter would scramble all the string variables if you used up too much memory. Thus in quite a few situations I ended up having to shorten sentences in the adventures to squeeze out a few more bytes and hopefully avoid crashing the system. Made it hard to come up with satisfying "adventurey" prose, or to add a lot of items or puzzles. The "sloppiness" was another reason I spun off and started up my own software company. I had a real problem with releasing buggy games, which meant my own productivity was far lower than a lot of what was available from Aardvark. After 15 revisions of my "Time Trek" game, Rodger took to tossing the cassettes with the new revisions in the trash, rather than fix the production "masters" to quash the bugs. Aha.. that one did go over..! Hmmm.... other bits of trivia... the names of the games had some odd genesis at times. After I delivered my real-time version of the classic "Star Trek" game (I'd originally gotten into computers to be able to play the Star Trek game that was available on mainframes using hard copy printouts, and my first big project was to do a graphical real-time version for my shiny new OSI Superboard II computer), Rodger decided to call it "Time Trek". When I pointed out there was already a TRS-80 (I think) game with that name, he said it wouldn't matter because they'd never know. Hmm. "Quest II" was actually the first version... Rodger decided "II" made it sound like a sequel and people would buy it because they like sequels and they'd probably think it was an improved version. Gak. Boy, those were the days...! Bob and I both wrote games for Aardvark. I wrote one of the only games using the Tiny Compiler that was published. It was a Centipede clone and was pretty good considering the C1-C4 limitations. I then moved on to the Atari and had some of my work published by Bob's company and well as Antic and Alien Group (the voice box addon). Those were the days.